The romance is increasingly integrated into the main themes of the show, and I think I’m finally either getting used to it or not as jarred by it as I once was. Anime romance conventions increasingly grate on me, and the past two episodes were chock full of them alongside the much richer reflections and visual symbols; either this one had less of them (I think this is the case), or there was just simply more emotional honesty than usual. 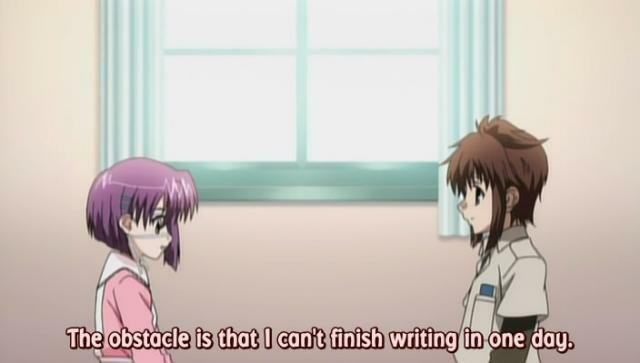 I actually really liked the confrontation scene between Miyako and Kei. 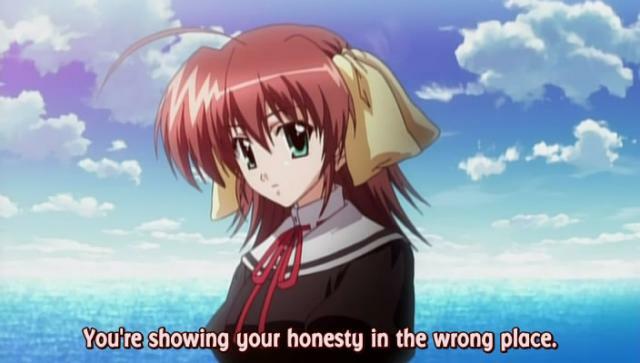 Miyako uttered what I’m sure will be a crucial line for Kei very soon: “you’re showing your honesty in the wrong place.” That’s a genuine insight, the kind that can make or break a person once she realizes what it means (and what she thinks that meaning is is a good reflection of where her mind is). The humor in Renji’s home between his mother, Kazu, and Chihiro was also well-timed and actually funny. Especially since I now always think of Renji = Raki. I mean, he even cooks and even jokes about having a diary. Can you get more girly-man than that? :) (The brief but simple and beautiful scene between Kazu and Chihiro as he takes her home is also revealing, which makes it the best kind of scene of this sort.) 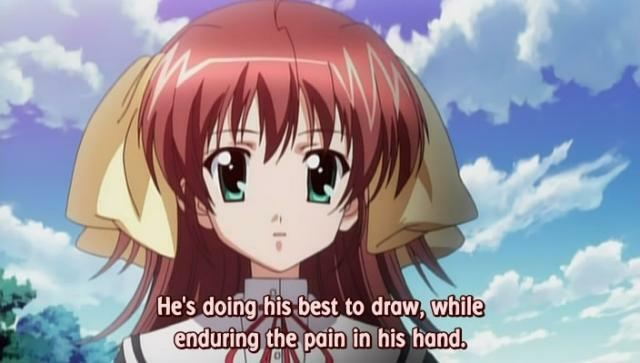 Plus, learning how the accident that injured Chihiro happened is a grim, appropriate way to unite the romantic and artistic themes of this show. I still thought, though, that Kyosuke’s confession was abrupt and underdeveloped, a victim of having so many plotlines to follow. I almost forgot: this is only episode 5! But you probably came here for more reflections on creativity and how it contributes to the intellectual and artistic prowess of this show. 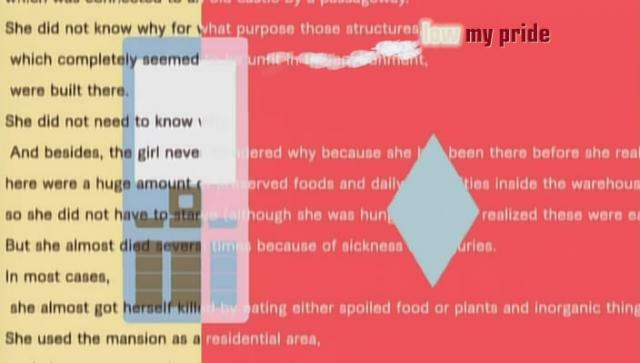 Learning that the words flashed in the terrific OP are, in fact, the novel outline Chihiro is writing was quite telling. 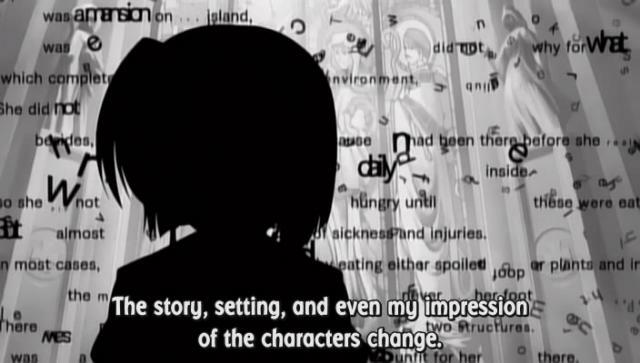 Words and the stories they contain are life for her; they surround her in the OP and everyone else and they make and break the silhouettes of the characters. I find it interesting that the words are all in English, as is the song’s lyrics, and the show’s very official title (there is no Japanese title, as the next episode preview announcer poorly pronouncing “ef~a tale of memories” testifies). I suppose English words for Japanese are more iconic? That would be ironic given that kanji/Chinese characters are themselves very pictoral, artistic even. Moreover, I’ve realized that the show is not just about artmaking in general–it’s about storytelling. All three male artists are working in narrative forms (manga, film, novel), and there is an explicit part of the flashback where the beginning of Hiro’s manga career was when he realized he had to learn to put together a story from the sketches he was drawing. Good storytelling is hard and in many ways is a separate skill from being able to shoot a great shot, draw a lifelike drawing, or even writing well. These characters are still teenagers, in a stage of life when their own narratives are still in flux. For there’s no question that the stories that these writers are telling are roman a clefs for the most part, direct echoes of their own lives. Especially Chihiro’s story, with the sad and compelling symbol of the chained sheep enclosed in a circular pen. (I’m very impressed by how it lead and ended the episode and tied the theme together.) What I’m curious is whether any of them will be able to get out of the outline stage. Planning a story was, for me, the most fun part; actually producing it was often a chore, though if I made it all the way through the feeling of completion was unbeatable. But I suppose that is the fear all of us with a little creativity have: that we will never be able to produce anything worthwhile and those glorious visions locked in our heads will never escape. 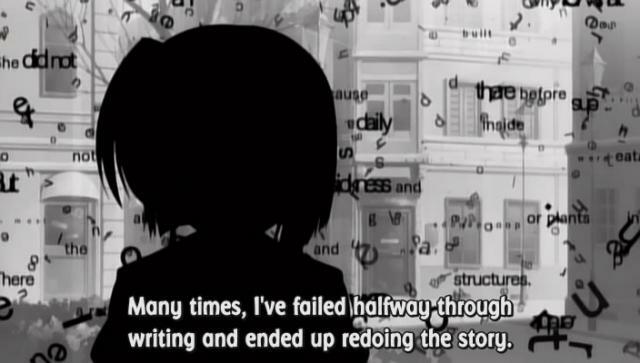 Chihiro must feel that pain acutely–I mean, she tried 31 times in four years to write a damn story. If that’s not a sign of a frustrated writer, I don’t know what is. I’m curious about the nun/angel figure who appears from time to time. I’ve jokingly referred to her in my talkbacks as the voice of God; we see her hanging around near the church the first time. It’s likely this is another Shinbo-ism and a representation of conscience, as other than her there is no hint of anything fantastic or supernatural about this story at all. She always appears at a time when a character is alone and is going through a dilemma or crisis. This is rapidly becoming the most memorable show of the current season for me. I’m now very fond of the OP song and the Shibo-esque imagery; I can’t get it out of my head. I’m also hoping that one of the hints given at the end (Kei, Kyosuke, and Hiro are all together now) means that the three of them will be collaborating on something. Thanks to Owen for showing me some additional insights into how the visuals of this episode contributed to the theme (monochrome as a way of showing a character’s limited viewpoint, etc) and for plugging my review of episode 3, which was one of the most joyous of reviews for me to write. It was like the light had finally completely gone on with regard to this show. Previous PostOur Tokyopop Profile (and a test post…)Next PostRingtone number 3 for the week – Made from Aya-chan’s new single! Why a light novel, pray tell? 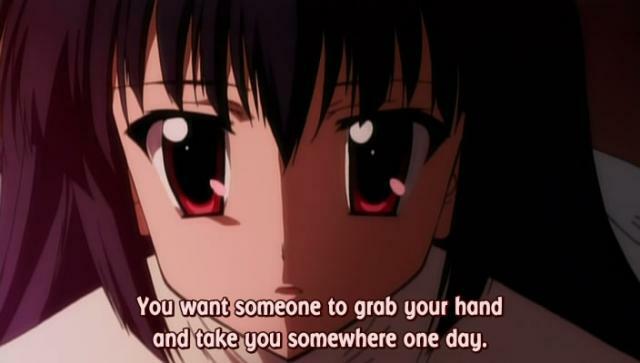 If you made an anime romance story, what will happen to the main characters at the end of the series? @Zhong: you’ll just have to find out, won’t you? :) Let’s just say my plan is to use those conventions for the purposes of heartfelt satire. I’ve always wanted to be a mangaka ever since I was little when I first grabbed a korean volume of Dragonball and even now, I still want to be one. Although for many different reasons, but they all come boil down to the fact that there is so much you can do with storytelling in manga. Manga needs to be paneled and designed in a way ‘effective’ in Japan according to the genre, but in the end, its all about the mangaka. good luck with your light novel! Hy, Michael! So, I agree with the mainly theme of the anime. Is about storytelling. I like very much your previous analisis, but since Renji doesn’t work with images (well, literary images, ok, but not exactly visual images), your present analisys is more accurate. Memory is the source of history. Telling history is always remember something. Art is a form of telling something in a new shape (even conceptual art, because that is a commentary about something, a critical retelling). I will keeping reading your comments. As also, I think that would help me to enjoy better a work that deserves our praise.